Candid, independent reviews of the best places to stay in Cambodia. From quality traveller digs to luxury hotels - handpicked by Rusty Compass. The Balinese styled La Residence d'Angkor is a popular choice for luxury travellers. The 252 at around US$50 is a stylish and a great buy. For a relatively new travel destination, Cambodia offers a superb range of hotel choices in both Siem Reap - where the temples of Angkor are located - and the capital Phnom Penh. From the hyper exclusivity of the Amansara in Siem Reap, the historic luxury of Raffles properties in both Siem Reap and Phnom Penh to a feast of delightful owner operated boutique hotels - most for less than US$100 per night and many from as little as US$40 - it’s easy to make your Cambodian accommodations a nice complement to the incredible travel experience. Angkor Wat’s popularity with high end travellers in the 1930s and later in the 1950s and 60s before war in Vietnam engulfed Cambodia ensured that deluxe hotel operators were quick to move when peace was restored to the kingdom in the early 1990s. 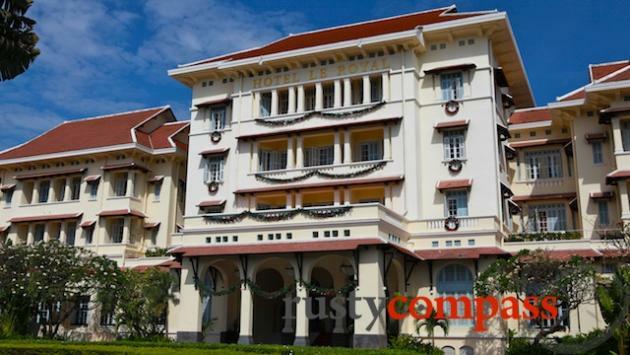 First out of the blocks was the Raffles Group taking over the country’s two grand colonial era properties - the Le Royal in Phnom Penh and the Grand d’Angkor in Siem Reap. It wasn’t long before other luxury operators were scoping out locations close by the temples. Today, Siem Reap is home to an excellent range of tasteful luxurious properties. Our picks include the exclusive and expensive Amansara, the historic Raffles Grand d’Angkor, the funky Hotel De La Paix and the Balinese styled La Residence d’Angkor. 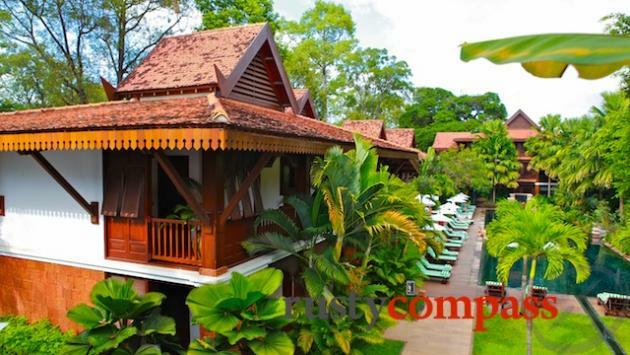 The Victoria Siem Reap does an impressive job as a colonial era reproduction as well. Outside of Siem Reap, the only other noteworthy property in the deluxe category is Raffles’ Le Royal in Phnom Penh. Don’t despair though, while the most indulgent luxury may not be available throughout Cambodia, a plethora of delightfully designed cosy boutique hotels provide an excellent alternative, are easy on the wallet and may well persuade you to the merits of staying in small independent hotels. One of the most exciting accommodation developments in Cambodia during the past decade has been a blooming of atmospheric owner operated boutique hotels. Siem Reap and Phnom Penh are bursting with options and there are some very nice spaces in Kep, Kampot and Battambang as well. There are lots of hotels that use the “boutique” appellation - many without good reason. So check our hotel listings for each place first. Many of the boutique hotels referred to above offer rooms under US$50 per night. And there are plenty of other options in our listings that may not be as pleasing from a design perspective but that are well located, comfortable and good value for money. Each destination in Cambodia has its own hotel listing on www.rustycompass.com so check these out for more detailed recommendations.